See more objects with the tag women's clothing, digital, mass customization, lace-like, 3D printing. This is a Dress. It was printed by Shapeways. It is dated 2015 and we acquired it in 2015. Its medium is nylon and its technique is selective laser sintering. It is a part of the Textiles department. At first glance, the Kinematics Dress looks like a simple black lace cocktail dress. But it is an entirely new approach to apparel design and construction, which deploys a variety of digital technologies to make a flexible, customizable, 3D printed garment. Fashionable clothing has generally been made from flat textiles, which are painstakingly cut and sewn into 3-dimensional garments. The creation of a Kinematics dress begins by importing one's body metrics into the Kinematics Cloth app. There, clothing designs can be adapted to any body shape using parametric body modelling technology. 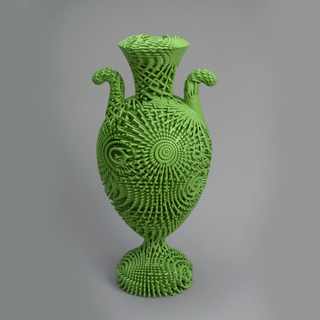 Unlike cloth, 3D printed objects are rigid. Kinematics provides a system for breaking down complex three-dimensional forms into thousands of individual components that interlock to create a dynamic mechanical structure. 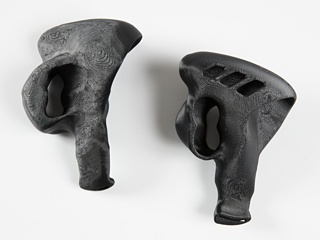 Each component is rigid, but integrated hinges connecting the components cause the structure to behave as a pliable plane, fluid enough to be worn comfortably on the body. Also, unlike traditional fabric, this textile can be designed to vary in stiffness, drape, pattern, and opacity across its surface. These elements can be customized using the Kinematics Cloth app. Most clothing items are too large to print in a 3D printer. Kinematics Fold is a simulation tool which uses rigid body physics to model the behavior of structures designed in Kinematics Cloth. The tool allows the garment designs to be “folded” into a printable block. 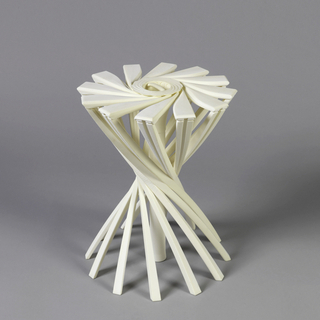 When removed from the printer, the flexible structure unfolds into its three-dimensional form. The Kinematics dress represents a new approach to manufacturing in which design, engineering, customization, and simulation are part of one seamless system, so that the object, once fabricated, is fully finished and complete. This object was donated by General Acquisitions Endowment. It is credited Museum purchase from General Acquisitions Endowment Fund. 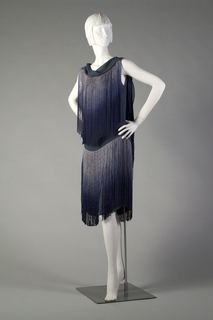 blue silk chiffon with applied blue ombré silk fringe. We have 1 video that features Dress, Kinematics Dress #4, 2015. This object was previously on display as a part of the exhibition	Making | Breaking: New Arrivals.